When your sails are baggier than your favourite tracksuit pants and have more patches than a boy scout's jersey, it's time to start thinking about replacements says Guy Wadilove. When the time has come to buy new sails, figuring out what you actually want the sail to do and how long you want it to last for is the best point to start. Unfortunately the obvious answers to these two questions: to power the boat as efficiently as possible, and to last forever, are probably slightly unrealistic. Instead, work out whether you actually need America’s Cup performance from sails that will last a season at best, or if you are better with a durable cruise/race sail that will serve you well for a number of seasons. Calling laminated material such as this sailcloth is a misnomer as there is not really any cloth as we traditionally know it involved in laminated sail construction. Generally speaking, the latest generation of laminated sails will now trump any panel-constructed sail by any measure (apart from possibly price for smaller sails). The advantages of using laminate technology is that lamination allows the sail designer to align the fibres directly along the load paths of the sail, whereas a panel sail can only ever approximate addressing the load paths. Aligning the fibres in this manner means that the sails can be built lighter, as fibres are only used where they are needed, and they will be more resistant to stretch as the fibres are directly in line with the stretching forces. Both construction techniques draw from a common pool of fibres including polyester, carbon fibres, Vectran, Kevlar, PEN and Technora amongst others. The properties of each fibre make them particularly suitable for some applications but unsuitable for others. Polyesters are a family of polymers of which Polyethylene Terephthalate (PET) is just one. Admittedly it is the most abundant one worldwide, but it is one of many, which include PEN and Vectran. Polyester is naturally a white fibre but it is also available in dyed black. It is the fibre that is used in the various forms of Dacron as well as in the cruising laminate ranges produced by some sailcloth manufacturing companies. Polyester is a cost-effective option and the fact that it is a relatively stretchy fibre means that it can be used to help keep down the loads on sheets and attachment points due to the elasticity in the sail. Mylar, which is used as layers in the lamination process of laminated sails, is also of the polyester family. When polyester polymers are biaxially oriented they become transparent as there is such a high degree of crystallinity that the gaps between crystallites shrink to less than 350nm which allows for full scattering by visible light. PEN is the big brother of PET. Recently its price has been rocketing as almost all the capacity worldwide is being used for producing tyres, and it is now comparable in price to Kevlar. PEN provides a significant increase in modulus over PET, so is very useful in those classes limited by class rules to lower modulus fibres (ie polyester fibres). One cosmetic issue with PEN is that the naphthalate in the polymer is prone to yellowing on exposure to UV light. The yellowed polymer is only a few microns thick, and if you poke underneath you’ll find the virgin white polymer unharmed, with the yellowed material actually acting as a sunshield. There is an associated loss in mechanical properties proportional to the amount of yellow sun-shield material, as well as not looking good, so more expensive measures are needed to protect the fibres from UV damage. It is usually used with UV blocking films and/or taffetas. Kevlar and Twaron are members of the Aromatic Amides (or Aramids to most people) family. Kevlar is Dupont’s version while Twaron is Teijin’s version of the material. Kevlar and Twaron are produced in larger volume than any of the other high-performance polymeric fibres, and that makes them the most affordable of all the high performance fibres (although they are still ten times more expensive than PET). They are produced in a variety of grades, with the roughly equivalent Twaron 2200 and Kevlar 49 being the most prevalent throughout the sailcloth market. They are basically a very good all-rounder at the high-performance end of the spectrum, with a high modulus and strength, but lower-than-average resistance to flex fatigue and not particularly good UV resistance. Technora, another aramid, is a close relative of Kevlar and Twaron. Technora is a black-coloured fibre originally developed to replace steel belting in tyres. It is a very durable fibre and is resistant to breakdown from either flex or UV. Technora has low stretch characteristics but does not out perform carbon or Kevlar. It is particularly suitable for combining with carbon or Twaron in a sail to increase durability and it is also used to reinforce those areas which experience a lower initial load, but are required to maintain strength for longer. Vectran (Liquid Crystal Polymer) is a light-brown fibre with significantly lower stretch characteristics than Polyester, but many other similar properties. The fibre copes well with flexing so it is especially suitable for performance cruising sails. Vectran however does not have good UV resistance so it should always be specified in conjunction with polyester taffetas on the outside surfaces of the sail to provide protection from UV. Vectran’s mechanical properties are almost identical to Technora although it has a better flex fatigue. It is a very durable fibre and a perfect choice for situations that demand retained mechanical strength after sustained mechanical abuse. Carbon fibre is a black fibre which has the highest strength and lowest stretch of all of the fibres commonly used in sailmaking. It is used where light weight and low stretch are essential for sail performance. It is often combined with other fibres in the laminate for added durability. Although the modulus and tensile strength of carbon fibre exceed that of all the other fibres, it comes at a price, with the brittle nature of the material resulting in lower resistance to flex fatigue which is why it is predominantly used in race sails. It is, however, virtually impervious to UV degradation and when used appropriately is a very useful fibre for superyachts, which have features like boom-furling mainsails which can limit the bend radius of the fibres while in storage. The majority of sails built for cruising are still panel sails produced from Dacron. 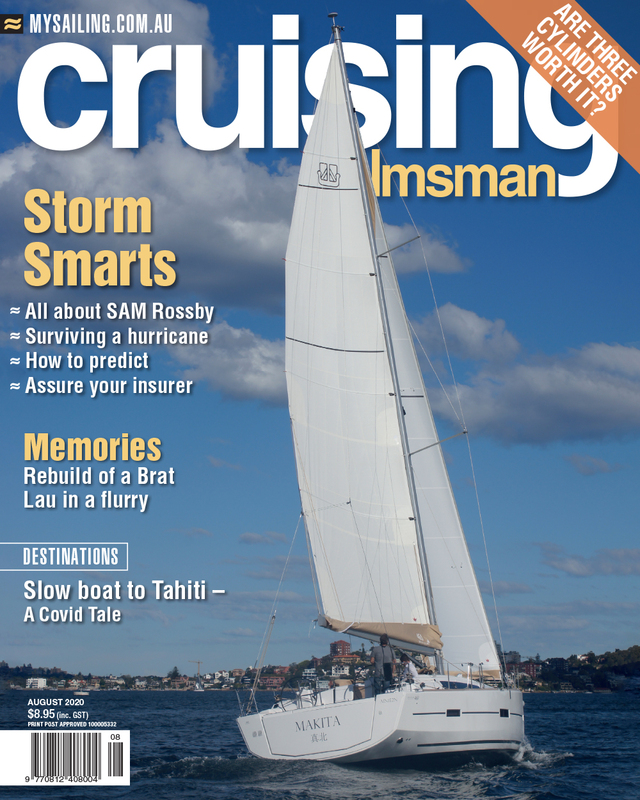 For higher-performance cruising sails, cruise laminates are usually recommended. Cruise laminates sails are still formed using a panel construction, but the material itself is formed as a laminate with woven taffetas laminated around films and polyester fibres. The fibres can be “beefed up” in one orientation to provide a better approximation of load alignment, hence giving better resistance to stretch. Fully laminated sails using polyester fibres are now also available as a cost-effective way of getting even higher performance from a cruising sail. Sails aimed at this area of the market need to deliver the durability required of cruising sails that are folded or furled, while maintaining the performance benefits of racing sails. Typically Technora, Vectran, and medium- to low-modulus carbon would be used in a cruiser race sail. The fibres are used in conjunction with specific resins which are selected for their long-term durability and resistance to high humidity and wet conditions. Further customisation with external taffetas to increase scuff resistance or internal taffetas to increase durability is also possible. Custom reef points can be built into the laminates to improve performance, and compression yarns can be added to larger sails to smooth the flow of air across the surfaces of the sail, again improving performance. The main qualities required of a race sail are resistance to stretch for shape retention, and minimal weight. Long-term durability is not normally a requirement for grand prix race sails, although in longer-distance offshore races it does need to play a part. The majority of race sails these days, particularly at the high-performance end of the spectrum, are laminated sails. Carbon fibre is a firm favourite for race sails because of its strength and resistance to stretch. For offshore racing, a carbon/Technora blend works well, combining durability and strength. A carbon/Kevlar (Twaron) blend, although not as high-performance as carbon/Technora, is ideal for most mid-range racing activity. Again the Kevlar provides the durability while the carbon gives strength. Certain class rules prohibit the use of high modulus fibres in sails (for example carbon and Twaron), so for this PEN is a great alternative as it has a higher modulus than PET. As mentioned, carbon fibre is a very useful fibre for medium to large cruising yachts and superyachts which have boom-furling mainsails and roller headsails that limit the bend radius of the fibres while in storage. You will often find carbon combined with Vectran on laminated superyacht sails. When yachts get over a certain size it is impractical for them to have panelled sails because of the weights involved. The majority of modern yachts over 35 metres will choose laminated sails to save on weight, both for crew handling and performance reasons. Ongoing research into fibres and the continual improvement of lamination techniques mean that the quality and performance of laminated sails are constantly improving. These improvements give the customer the chance to sail with sails that work more efficiently and that will last longer. Obtaining sound advice on the correct mix of construction and fibres for the type of sail that you want will only enhance your sailing experience. Note on table figures: All the mechanical properties of the fibres shown above are average values for fibres commonly used by Doyle Sails. The theoretical modulus and strength of a "perfect" fibre is actually quite a bit higher than those quoted above, but it is impractical to produce fibres with mechanical properties that get so close to that of the crystal structures.